My name is John Klazinga, and I am owner/operator of Quality Woodworking. After being involved in home construction and renovations for a number of years, I decided to focus on the finish carpentry side of it. 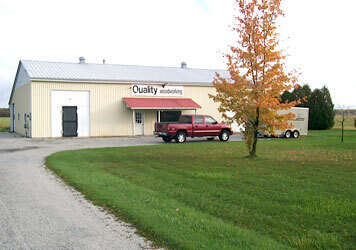 In September 1981, Quality Woodworking was established. Although our initial focus was on custom commercial millwork because of demand, we soon expanded to include residential kitchen cabinets and vanities. Over the years we have had the opportunity to be involved in many interesting projects throughout Lambton County and Southwestern Ontario. Our dedication to searching out the best products and supplies and paying attention to the minutest details of each job, has given us a reputation that has given us a wide customer base. We have decided to remain small to better focus on quality, personalized service, always seeking ways to improve. Much of our work comes due to references from many of our satisfied customers and we invite you to become a part of that list. Living by this motto we seek to manufacture a quality product in a timely fashion for a reasonable price, doing all we can to satisfy the customers.